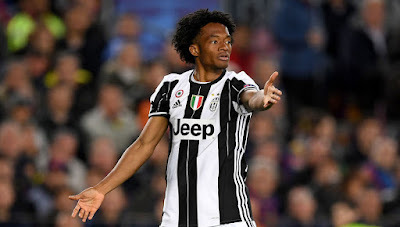 Juan Cuadrado - Finally signs for Juventus and puts an end to Chelsea nightmare. You have to hold your hands up and admit that Chelsea very rarely get their transfers wrong and if they have, there has only be a few but Juan Cuadrado was one of them. When he signed for the club for £23.3m in the January transfer window 2015, I had to be honest and admit that I knew very little about him. As all of us would do, we turned our attention to the Internet to learn more about him, to watch videos of him and to get to know the player we had signed for let's face it, big money. The most important question I had at the time (and with every new signing) was "does he provide competition for places within the squad to improve the options we have available?" I wasn't so sure. It became crystal clear after a few brief appearances in games that he was way out of his depth in the Premier League. He had more than proved himself in Italy and Serie A but in England the game is very, very different. As we all know it's faster, it's stronger and more physical. Within the first few appearances we watched him struggle to adapt to the game, struggle to cope with the pace and struggle to stand strong as he was literally shoved out of the way, tackled and the ball taken away from him. Thinking back now his only real contribution to Chelsea was to win a penalty for us at the Bridge but that was about it. Everyone finds their level and in Italy he has found his. He will be a fantastic player for Juve having signed for £17.3m on top of the £4m loan fee we have received two seasons running from the Bianconeri. I have little doubt about that but it is a shame that he couldn't settle down here. Of course there will be the argument that he was never given much of a chance and for someone like him coming to a new country, you need to play regular football to get used to the way the game is here. He was never going to get that and others have come here and settled straight into Premier League life. The major positive is that it's more money in the kitty for this summers transfer business!